Vehicles are available with 9 to 53 seats, which rises to 63 seats for parties of schoolchildren. There is no indication of involvement in interurban routes. When researching these histories information in the public domain usually stops at about the year 1985, as more recent material is not accessible – still considered as commercially sensitive. The 1988 SARL above bears little resemblance to the Sivignon story which goes back to at least 1947. Cogny is 8.5 kms to the west of Villefranche. When in 1934 the law obliged départements to map, register and control passenger transport in their jurisdiction, Pierre Lafont declared that he was operating this route using a 23 seat vehicle and charging a 3F fare for the full journey. He said he had been running the route since 1st November 1926. In 1940, wartime restrictions limited the route to 2 returns daily plus an additional 2 on Mondays. The vehicle at the time was 9516 PF 3, a 1932 Ford with 25 seats. 1948. On 13th November, Mr Lafont sold the route, with the sale act being drawn up by the ‘Etude Iserable, Notaire à Anse’. 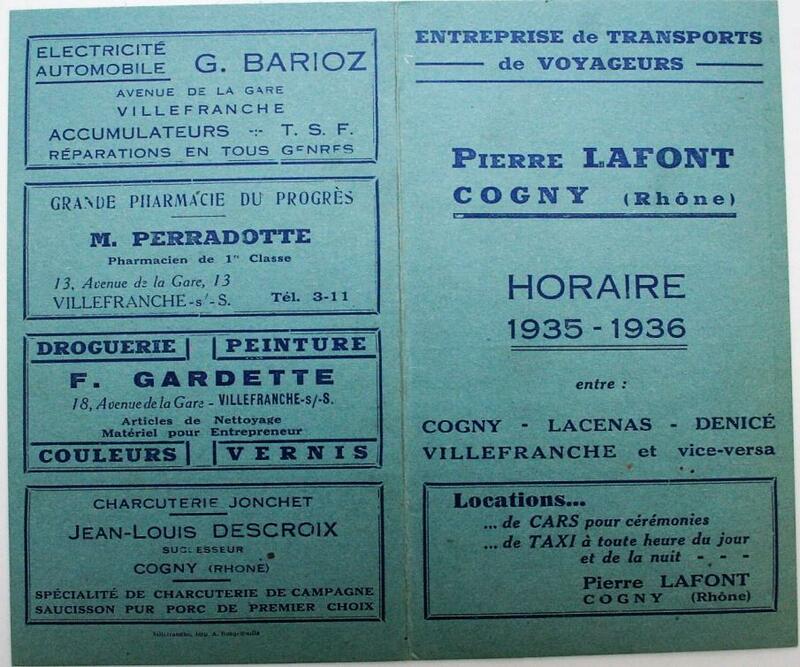 We learn of the sellers that Pierre Lafont was born at Cogny on 12/12/1892, and his wife Rose née Pernet, was also born at Cogny on 25/02/1895. It was on 01/06/1927 that they had acquired a hotel, restaurant and café business, as well as the associated bus route, from Antoine Teillère, for 12,000 Frf. Now they were only selling the bus business, and retaining the rest of their activity. The route was described as Cogny to Villefranche via Lacenas and Denicé, with a licence for 3 daily returns plus 3 more on Mondays and 1 more on Thursdays and Sundays. The purchase price was 220,000 FrF (15,000 Fr for fixtures and fittings, the rest for goodwill). The purchaser was Joanny Joncières, born at Villeurbanne on 12/05/1893. The impression given was that while Mr Lafont had been happy to let the bus service drift, Mr Joncières was full of energy, and wanted to develop his newly acquired business. He immediately requested an authorization to operated 19 returns per week, to bring real frequencies, as opposed to the theoretical licences held, back to pre-war levels. These timings were to be 5 on Mondays, 0 on Tuesdays, 2 on Wednesdays and 3 on all other days. The CTD – Comité Technique Départemental – dragged its feet and after much haggling, finally agreed only in July 1950 to 18 returns – one on Wednesdays and Fridays, none on Tuesdays, 4 on the other 4 days of the week. 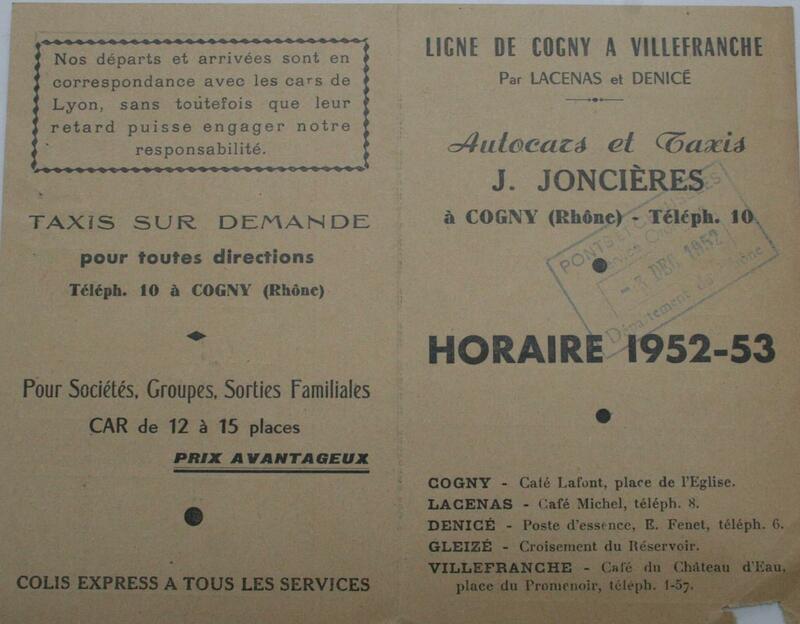 While this was going on, Mr Joncières put in a second request in March 1949 – to extend the route to Lyon twice a week (once on Monday, once on Thursday) with a departure from Cogny at 07.30 and a return from Lyon at 17.30. This was refused by the CTD until the publication of the decrees of application of the 1949 REGLEMENTATION DES TRANSPORTS, and never appears to have happened during Mr Joncières’ time. To be fair to the CTD, this was the immediate post-war period, and in practice, frequencies were still being held at wartime levels, possibly because of the need for fuel economy. Authorizations also became harder to obtain ahead of the publication of the new REGLEMENTATION DES TRANSPORTS, which was expected to give guidance on how new route and frequency applications were to be treated. 1953. Maybe Mr Joncières had had enough; maybe he was retiring at the age of 60. Either way he sold out on 1st December 1953. The purchaser was Paul Descamps, born on 08/01/1911 at Thory (Somme), and domiciled at Bovelles (Somme). The Cogny – Villefranche route was now described as 3 returns daily plus 3 more on Mondays, 1 more on Thursdays & Sundays, but currently only authorized as 2 on Tuesdays, 3 on Sundays, Wednesdays, Fridays, 4 on Mondays and Saturdays, 5 on Thursdays. 1953 Turnover 1,300,228 Profit 157,214 For the year up to date of sale. In October 1959, Mr Descamps was advised by the PTT postal authorities that they had now purchased a fleet of motor vehicles, so the contract to carry post would cease with effect from 15/01/1960. This was general and applied to all the 16 Rhône bus operators involved in providing this rural service. Bicycles were not sufficient for carrying post over long distances, so ‘post buses’ had done the job until then. This was a serious loss of income for Descamps - it involved a loss of income of 195,36Frf paid three days a week for ordinary post (a price fixed in 1953 and never adjusted for inflation) plus 880 Frf per day for each of the other 4 days when urgent post and ‘messageries’ were carried. The total was estimated at around 15,000 Frf per month. Mr Descamps was unhappy, but there was nothing to be done, except adjust timings on the route, where it was no longer necessary to run a journey at inconvenient hours because there was post to be delivered. 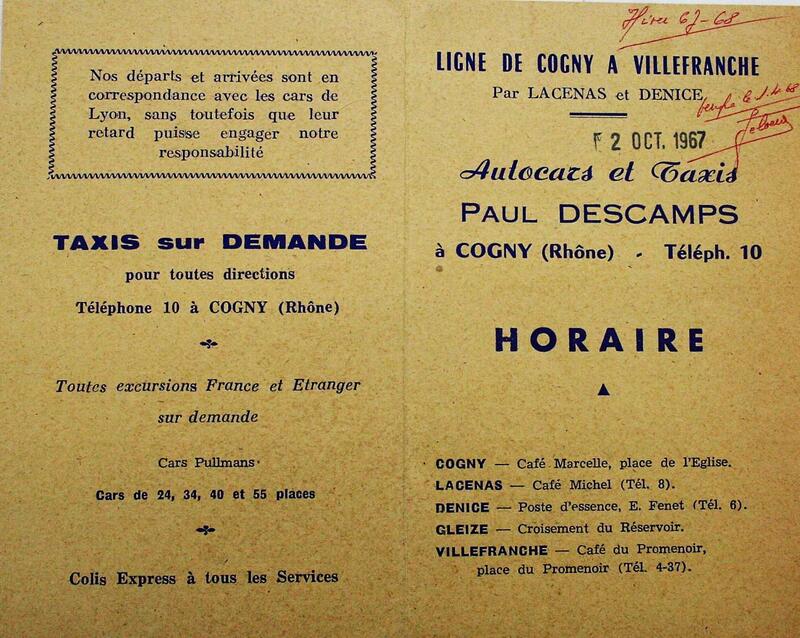 Also in 1959 – perhaps in search of replacement income, Mr Descamps obtained an authorization to operate a market service from Quincieux to Villefranche on Mondays – into town 9.05 to 9.25, with the return 11.30 to 11.45, and a fare of 1,20 NF. In 1961, the frequency was reduced to operate only on the 1st and 3rd Mondays of the month. Then on 7 Aug 1961, Mr Descamps wrote that, as there were no more passengers, he would be cancelling the service with effect from September 1961. In 1962, he proposed a specific schools journey running Rivolet – Montmelas – Villefranche, for 22 pupils that had been identified as potential users. This was a return distance of 24 km plus a positioning return journey of 9 kms from Cogny to Rivolet. The subsidy required was 1.21 NF per km for the 24 km and 0.90 NF per km for the 9 kms. Timings: Rivolet 07.15 – Villefranche 07.45, then return 17.00 – 17.30. 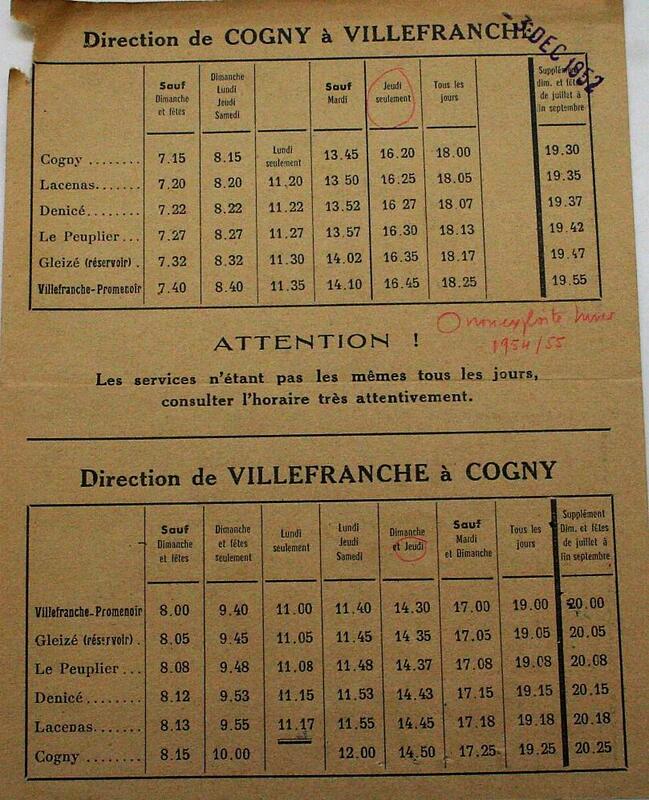 And he added a dedicated schools return on the Cogny to Villefranche service – timings 07.15 – 07.40 inwards with returns at 17.00 to 17.25 and 19.00 to 19.25. A 40 seat vehicle was provided and whilst fares were graduated a return ticket for the whole route cost 1.80 NF. In the 1960s and 1970s; profitability of country routes was in severe decline. 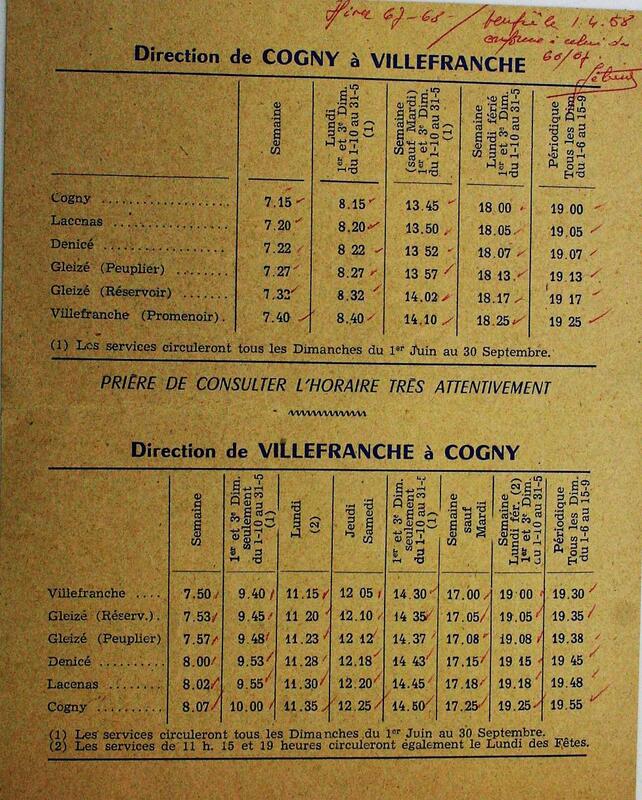 In 1966 on the main Cogny – Villefranche service, Descamps wanted to reduce service – cancellation of the 08.15 on Thursdays & Saturdays, cancellation of all Sunday service between 15 June and 15 September. This was agreed by the CTD. By 1970 passenger numbers were falling further and route reductions were requested during the school holidays. – the table below shows Sunday loadings from 1968 to 1970, with a decline from 41 in October 1968 to 6 in January 1970. 1973 - Mr Descamps had had enough! On 26/11/1973 he sold to the Sivignons. Total sale price 180,000 Fr (125,000 Fr for goodwill). But there is nothing conclusive to be found. And every Monday of the year (market day) a service into Villegranche > 08.15 – 08.40, with return < 12.15 – 12.40. When the route was discontinued is not known. Services originating with Mr Hidrio. Jean Hidrio was born in Paris on 01/11/1905, and was domiciled at lieu du Bourg, Juliénas. In 1940, also using the trading name Car du Haut Beaujolais, he was authorized to run from Jullié to Pontavenaux via Juliénas (2 daily returns). In 1945, Hidrio Inquired of the Military Government what had happened to his Citroën 7cv 4280 PG 2 requisitioned by the FFI on 18/08/1944. The Comité d’Organisation des Transports Routiers replied that it was to be found at Part Dieu, Lyon, so presumably he got it back ! 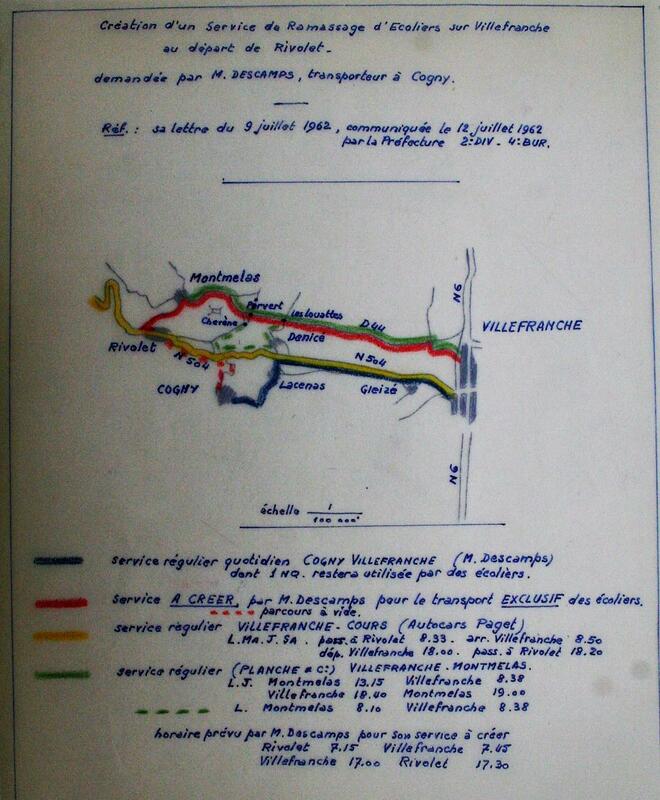 After the war, in 1948 he wanted to extend the route to Lyon, and when this request appeared to have little chance of success, he changed this to Mâcon (Mâcon was refused by the CTD in April 1949, although he was already operating it!). So he sold the rights to the route to Jacques Trunde on 10/06/1954, together with a second service from Jullié to Juliénas. Edouard Jacques Trunde, also domiciled Lieu du Bourg, Juliénas, was born at Juliénas on 20/03/1931. The sale included 2 vehicles and a taxi licence. Mr Trunde’s insurance agent identified the vehicles as a Citroën 11cv 14 seats registered 6167 V 69 and an Isobloc 19cv 20 seats registered 4888 X 69. The sale price was 300,000 Fr, of which 100,000 Fr was the goodwill. This was another route that carried post, and an estimation of annual remuneration was recorded as 56,222 Fr. However, an attestation from the postal authorities in December 1952 states that he received 78,612 Fr for the period 01/11/51 to 05/03/52, and 159,612 Fr for 05/03/52 to 31/10/52. What exactly was Trunde’s role? It is not clear, for only two years later, in 1956, he sold the route rights (with no vehicles involved) to Mr Sivignon for 150,000 Fr. This hardly appears to have been a good investment, as in 1960, Sivignon closed the Pontavenaux route. 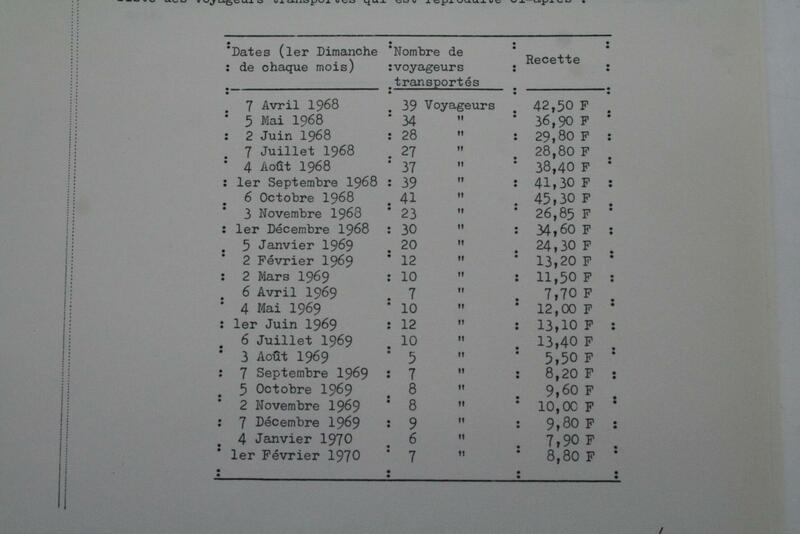 Another transaction, on 04/03/1953, saw Hidrio selling Sivignon the rights to his route from Cenves to Lyon for 225,000 Fr. although these figures were for all his activities and it was stated that the route accounted for about one third. When route registration began in 1934, Mr Callot, of Avenas (Rhône) declared the existence of his route in October 1933. This was a Thursday market service from Avenas to Villié Morgon, with the outward journey 07.30 > 08.05 and the return 11.00 > 12.05 using a Citroën 12 seater registered 949 PF 1. 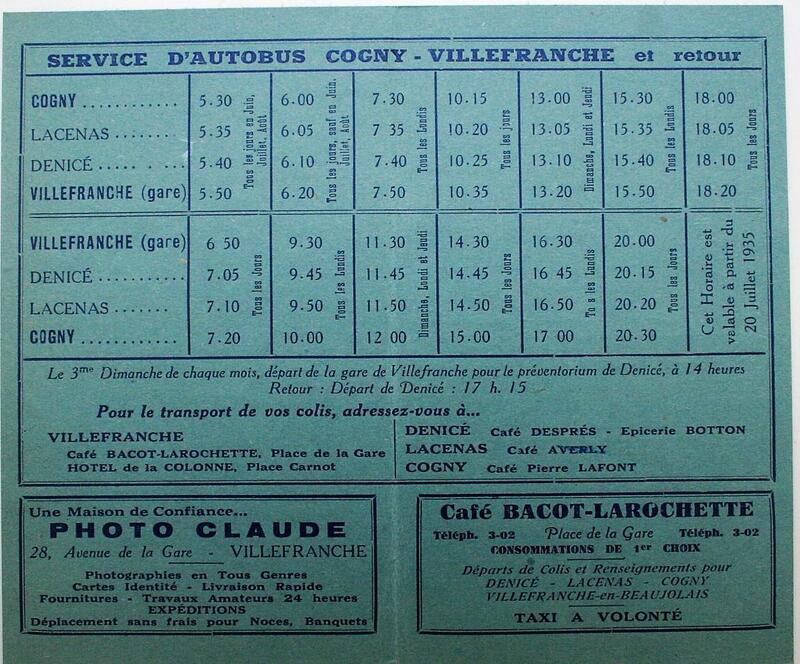 On 01/02/1947, these routes were sold to Sivignon for 30,000 Fr. Two vehicles changed hands - a Citroën 13cv, 22 seats, 5563 PG 2 and a Delahaye 10cv, 15 seats, 1992 PF 1. Both vehicles are described in the act as “well worn”! The sale price was nevertheless 600,000 Fr (100,000 for the licences, 500,000 for the vehicles). In 1949 For the Romanèche service, a subsidy of 45,000 Fr was voted by the municipality of Fleurie. This was designed to have the service operated daily instead of just 3 days a week. All the authorities were appalled by the size of the subsidy, and the ‘sous-préfêt’ put pressure on the municipal council to reduce it to an acceptable level – the result is not known. The earliest date discovered is June 1948. That is when Mr Sivignon obtained licences for market services Avenas to Belleville on Tuesdays, and Avenas to Villefranche on Mondays. Sivignon is recorded as being domiciled in St Joseph at the time. On 06/10/52, Sivignon purchased from Chanut the route from Tramayes to Belleville with extension to Lyon authorized by ministerial decision. The price was 250,000 Fr. Jean Chanut, of 1, route de Charentay, Belleville, had begun operations on 10/08/30 in partnership with Pierre Dumonceau, and in 1952 appears to have been the major operator on the Beaujolais to Lyon corridor. The authorities were not impressed. The CTD – Comité Départemental Transports wrote in 1952: ‘ Mr Sivignon s’acquitte toujours aussi mal de l’exploitation de ses services réguliers pour lesquels un véhicule de dépannage lui est indispensable, et continue à effectuer sans autorisation, des services exceptionnels et occasionnels…….CTD Voyageurs 1952’. Planche wins a court case against Sivignon, who is ordered to pay 2,000 Fr damages for not respecting setting up and setting down restrictions. 1961 – Sivignon took over a St. Christophe to Tramayes market service from RSAR. They operated from 21/04/61 to 27/04/62 when it was discontinued for lack of patronage. - Belleville-Tramayes – 0,438 F It was said this route began in 1959, when the Beaujolais network was reorganized, specifically at the request of the PTT. 1966 – 15 December – In this decade when the country bus was slowly fading away, Sivignon requested a reorganization of his services as the situation in 1966 was critical – 135,000 km run with two vehicles for revenue of less than 80,000 FR. 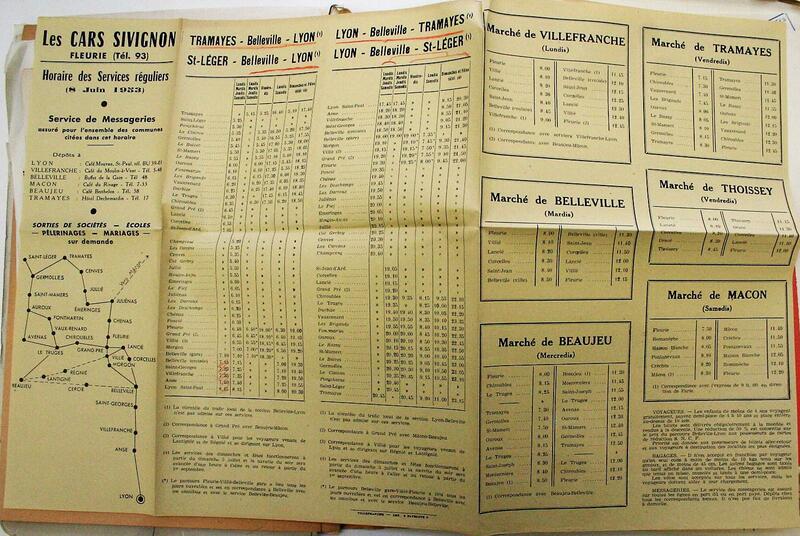 The routes concerned were a Belleville Gare to Jullié shuttle, a Jullié to Macon shuttle, and routes to Lyon. Villages likely to have no service were Tramayes, St. Mamert, Ouroux, Vauxrenard, St. Joseph, Chiroubles. 1970 – On the trunk Tramayes - Lyon service, the authorities agreed to the cancellation of some timings on Tuesdays, Fridays and Saturdays.. The Wednesday Tramayes - Beaujeu market service was discontinued. Passenger numbers were falling. There were more service reductions on Tramayes – Lyon. Cancellation of all Thursday journeys; cancellation of 2 Sunday timings between 15 September and 30 June. 1972 The Jullié – Macon route. All Tuesday journeys were cancelled. This sector was complicated by the fact that Maisonneuve was also present, and in October 1970 they had been in the courts where Maisonneuve won a case for ‘concurrence déloyale’. But it seems that at the same time, Sivignon was asking for additional timings as a consequence of these revenue figures. 1979 The Villefranche to Lyon section of the Tramayes - Lyon route was officially declared as abandoned by the authorities, although it had not physically run for a number of years. 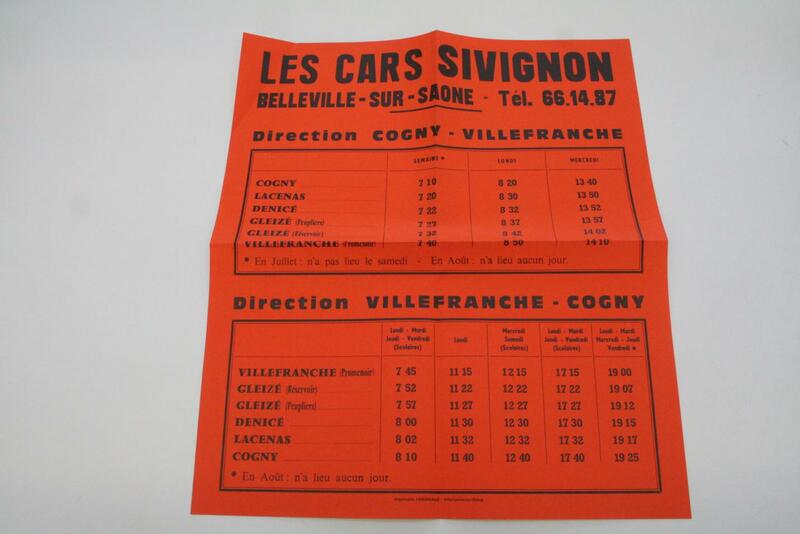 Whilst Sivignon must have closed down all its regular and market services, Planche set up a service on a 6 month trial basis running on Fridays from 02/09/83.The route was Cogny, Lacenas, Rivolet, Denicé, Villefranche, with a departure from Cogny at 07.50 and the return from Villefranche at 11.30. This is where we came in! The wheel turns, although it is doubtful whether the trial was successful. In the course of this research, a number of vehicles, other than those cited in the text, were identified. For those interested, here is the list. The year or date that appears is the date when they were known to be operating for the company. 1951 Sivignon Citroën 45U 17cv 3276 PG 6, 26 seats.